Eating the right type of fish is becoming increasingly important, with some species on the brink of collapse because of over fishing and the frankly shameful practise of fishermen not being allowed to land perfectly good fish because of their quotas. We’re at a crossroads in our relationship with the ocean, and there’s really only one way to go…treat the seas with more respect, or there won’t be any fish left. Selfridges Project Ocean Fish Guide app is a great little resource for those times when you’re stood in front of the fish counter, trying to remember whether or not a particular fish is OK to buy from an environmental and sustainability point of view. It’s a simple concept – the app lists most of the fish commonly available to the British market and indicates whether they’re OK to eat or best avoided. The call on whether to eat or not comes from the Marine Conservation Society, so you’re in good hands. Aside from the all important eat/don’t eat list, there’s a clutch of fairly tempting fish-related recipes from the likes of Angela Hartnett and Tom Aikens. Antonio Carluccio’s Sardines in Tortiera looks like a must-try – butterflied sardines, sprinkled with chopped oregano, breadcrumbs and lemon juice, quickly baked. It’s simplicity itself and neatly demonstrates why Italian food is so good – good ingredients, cooked with restraint and allowed to shine. It’s a clear and well designed app, easy to use and concentrating on the key information in a striking visual style. 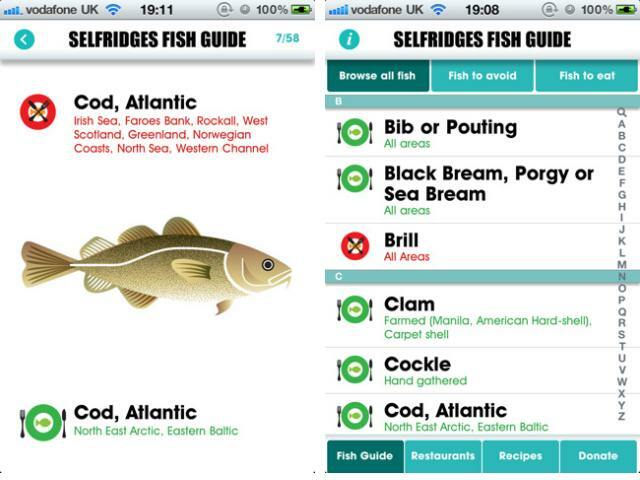 The Fish Guide app is part of Selfridges wider Project Ocean campaign, which challenges people to imagine a world with no more fish in the sea. Developed in partnership with the Zoological Society of London, Project Ocean aims to highlight issues around the sustainability of commercial fishing and offer conservationists with a forum for their work. Selfridges have already eliminated all endangered species from their food halls and restaurants, and built on this by sponsoring a marine reserve in the Philippines. There’s plenty going on as part of Project Ocean. More details here. The Fish Guide app is a free download from the Apple App Store. iPhone only, I’m afraid (boo!). If you’re interested in marine conservation, have a look at this post about Hugh Fearnley-Whittingstall’s Fish Fight, and maybe make yourself a mackerel bap or two. I think this is brilliant idea. And if that wasn't enough, their window displays at the moment are genuinely innovative and very striking. It's like having an aquarium in a department store!